Prior to the financial crisis that rumbled outward from the United States and shook the global economy, the majority of people around the world viewed the U.S. as the planet's leading economic power, according to a survey conducted by the Pew Research Center in 2008. At the time, China -- despite decades of rapid expansion -- received only half as many nods at No. 1 as did the United States. The financial crisis and subsequent recession vastly altered those perceptions. No longer is the U.S. viewed as having a cloak of invincibility. According to 26,000 people interviewed from 21 separate countries by the Pew Research Center, the U.S. is no longer looked upon as the world's leading economic power -- the title now belongs to China. China doesn't fit the mold of a traditional economic superpower. Many of its residents live below what many of us would consider the poverty line and its vast countryside is still dominated by an agrarian economy. It's taken 160 years, but in 2011 China reclaimed its dominance as the worldwide leader in manufacturing output. Responsible for 19.9% of world output compared to the United States' 19.4%, China has retaken the title the U.S. had held for the past 110 years. 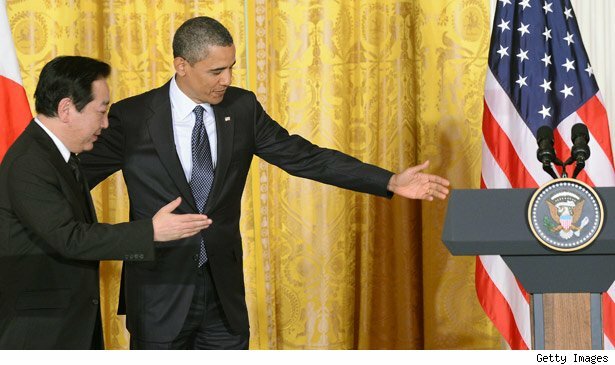 China's success relies on two comparative advantages that the U.S. simply doesn't have. First, China has a gigantic labor force. With approximately 89 million more people involved in industrial production in China than in the U.S., more bodies are capable of producing more goods. Although U.S. workers are far more productive than their Chinese counterparts, it's a sheer numbers game that China will win every time. Secondly, Chinese labor is considerably cheaper than U.S. labor. In the United States, the government has set the federal minimum wage at $7.25. Chinese minimum wage laws differ across its 31 different provinces and can run as low as 600 yuan per month to as high as 1,450 yuan per month -- in U.S. dollar terms, that's roughly $94 to $227 each month. Having debt is never a good thing, but it's been a particularly touchy subject over in Europe. Greece, Ireland, Portugal, and now Spain have all succumbed to unsustainable debt levels, and that has left many American citizens wondering if we're headed down a similar path. When the U.S. government chose to raise the debt ceiling last August for the 78th time since 1960, U.S. debt stood at $14.3 trillion. Of that total, nearly $10 trillion is held by individuals and corporations, as well as by state, local, and foreign governments. According to U.S. government statistics through mid-2011, China is the largest public debt holder, with $1.13 trillion -- slightly higher than the $1.11 trillion U.S. citizens and corporations own in U.S. debt. China ranks behind only the Social Security Trust and the Federal Reserve (which only owns U.S. bonds as part of its two quantitative easing measures) in terms of total U.S. debt holdings. As the U.S. continues to drive further into debt, China stands ready to keep collecting the interest. The U.S. may still have the world's largest economy by Gross Domestic Product, but as of 2010 it no longer consumes as many barrels of oil equivalent each year as China does. The rapid industrialization of China is one of the primary reasons oil prices have risen so dramatically over the past decade. Whereas 71% of U.S. GDP is tied to personal consumption, China's growth stems from its manufacturing sector and its continuing infrastructure build-out -- both very energy-intensive segments. Although China still derives much of its energy production from coal, its reliance on oil is increasing. Saudi Arabia, the world's biggest crude exporter, now ships more to China than to the U.S. and looks first to China rather than the U.S. to decide whether or not to increase production. China's foreign practices also give it an edge. While U.S. companies are constrained in their expansion efforts by politics, China has stated its willingness to build refineries in Iran. In further expansionary efforts, China-based oil company CNOOC (CEO) attempted to infiltrate the U.S. market by bidding on Unocal in 2005, but the move was blocked and Chevron (CVX) eventually outbid the government-owned oil giant. It appears the power that China can exert on the oil market is only growing. The United States is the largest economy based on GDP right now, but it probably won't be for too much longer considering China's decades of outperformance. 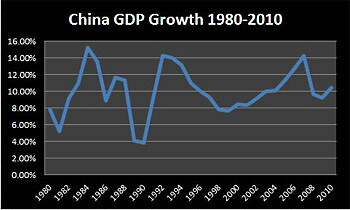 Since 1980, China's GDP has grown by an average of 10.02% annually. Based on its projected growth rate of 7.5% as predicted by Premier Wen Jiabao in March, China is on pace to surpass U.S. GDP growth, which has averaged just 2.67% since over the same period, by 2019. Even if China's GDP growth slowed to just 5% -- which would be very rare from a historical perspective -- it would surpass U.S. total GDP by 2021. That type of consistent outperformance simply can't be ignored. As you can imagine, with so much emphasis placed on the manufacturing sector, the demand for precious metals including copper, gold, and silver is rising dramatically. These precious metals are used in everything from construction to electronics manufacturing, their applications are widespread and China's demand for them is absolutely insatiable. China overtook the U.S. in copper consumption in 2002 and now uses more than four times as much annually. Copper producers like Freeport-McMoRan Copper & Gold (FCX), which counts China as its largest customer, rely heavily on Chinese demand to buoy copper prices, the lifeline to its profitability. Gold is also rapidly becoming an investable source of wealth in China, with high inflation rates threatening to devalue workers' earnings. Between 1950 and 2003 the Chinese government barred citizens from owning gold bullion, so it wasn't until recently that Chinese citizens were able to invest in the shiny yellow metal. It took just eight years for China to surpass India in gold investment demand since that ban was lifted, according to The Wall Street Journal. PetroChina (PTR) in the oil and gas industry and China Unicom (CHU) in telecommunications ranked as No. 5 and No. 8, respectively, in terms of the world's largest companies as of the second week in July. That may not sound all that impressive, but consider that two additional Chinese companies -- Industrial and Commercial Bank of China and China Construction Bank -- are sitting just outside the top 10, and you'll realize that China's dominance as an economic power is beginning to be reflected in the underlying large corporations that call China home. This is important as it signals another possible shift away from the United States' dominance among the world's largest companies. With seven of 10 spots, the U.S. isn't going to give up that title just yet, but China's growing domestic infrastructure build-out as well as its international expansion will only give PetroChina and China Unicom a high-growth advantage over the United States' largest companies, which are growing at a more tepid pace. In spite of its reliance on "dirty fuel" coal to produce the lion's share of its energy, China has become the world's leading investor in renewable energy initiatives -- at least according to Chinese environmental officials. In 2010 China invested the equivalent of $154 billion in green initiatives and plans to pour the equivalent of $473 billion into green energies between 2011 and 2015. Through various programs including the "Top 1000 Enterprises Program," which focuses on reducing energy use at the nation's largest enterprises, and "10 Key Projects," which offered incentives to build hydroelectric and renewable fuel sources, China is spearheading investment in renewable fuels and slowly weaning off its dependence on coal. Europe and the U.S. may not possess the demand required to prop up clean energy companies, but Chinese demand might be the driving force that takes green technology companies to the next level. Chalk up another U.S. defeat as China became the largest manufacturer of smartphones in the first quarter of 2012. Year-over-year unit growth rocketed higher by 45% with China shipping 146 million units in the first quarter. That compares to unit volume growth of just 5% in the United States in the same period. One of the primary reasons China now commands 22% of the U.S. smartphone manufacturing market while the U.S. sits at just 16% is due to Apple (AAPL) choosing to manufacture the iPhone 4S in China. Apple, which sold 35 million iPhones last quarter, is seeing its market share quickly creep up on region-leading Samsung. Although Apple has added to China's smartphone dominance, approximately two-thirds of all global shipments from China run on Google's (GOOG) Android operating system. As you might imagine, with more than 1.3 billion mouths to feed, China's combination of rapid economic expansion, high food cost inflation, and population growth have firmly placed it above the U.S. in total consumer spending on groceries. According to research firm IGD, in 2011 Chinese consumers spent the equivalent of $964 billion on groceries versus just $908 billion in the U.S. By 2015, these figures are forecast to grow to $1 trillion in the U.S. and $1.6 trillion in China. With much of China still rural and agrarian, food imports into the country have been relatively small. But how long can China remain self-sufficient in food production? Not nearly as long as you might think. As China's industrialization continues and people leave farming jobs to join the higher-paid skilled working class in major cities, the demand for imported food staples like corn and rice could rise dramatically. If you think food inflation is a problem now, give China a few more years to expand its population and infrastructure. Finally, China's importance as a trade partner is too obvious to ignore. From an export perspective, 30 U.S. states count China among their top three export markets while 48 states have more than doubled their export growth to China since 2000. With exports now totaling more than $100 billion, Chinese consumers are quickly becoming a priority for U.S.-based companies. This street runs in the opposite direction as well. The sovereign debt crisis in the European Union caused consumer buying to dry up in 2011. Thankfully, a trade surplus from the U.S. more than made up for the EU's lack of demand. In fact, China's trade surplus with the U.S. is the sole reason it had a positive trade surplus of $155 billion through November of last year. Since 2008, China's reliance on the United States to contribute to its trade surplus has risen from 90.1% to 175.6% through November 2011. Chalk up another win-win scenario for China. Motley Fool contributor Sean Williams (on Twitter @TMFUltraLong) has no material interest in any companies mentioned in this article. The Motley Fool owns shares of Freeport-McMoRan Copper & Gold, Apple, and Google. Motley Fool newsletter services have recommended buying shares of Chevron, Apple, and Google, as well as creating a bull call spread position in Apple.